Guitarist and ethnomusicologist Bob Brozman was found dead aged 59 at his home in Ben Lomond, Santa Cruz County, CA, on April 23. Bob Brozman’s death was ruled a suicide, according to the coroner’s office of the Santa Cruz County Sheriff’s Department and no more details were released up to now. The American virtuoso guitarist was a musical pioneer who explored a vast range of cultures in more than 30 albums, the fruit of trailblazing research and recordings in Hawaii, India, Africa, Japan, Australia, Greece, Papua New Guinea and Reunion Island. Bob Brozman was born in New York on March 8, 1954. He was involved in music since early childhood. A guitarist since age 6, Bob Brozman discovered National resophonic guitars at age 13. In their unique sound, the young Bob found his musical calling. He studied music and ethnomusicology at Washington University with a focus on the earliest roots of Delta blues. He became a respected authority on historical Hawaiian music, publishing articles and put together a large collection of 78rpm records. He produced five re-issue albums from this collection on the Rounder and Folklyric labels, documenting the best of Hawaiian music from 1915 to 1935. In 1988, Bob Brozman rediscovered the legendary 1929 Hawaiian recording artists, the Tau Moe Family. Together they recorded a landmark album, Remembering The Songs Of Our Youth, a historic re-creation of the family’s genuine Hawaiian music from 60 years prior. The album was released in 1989 to rave international reviews, including the Library of Congress Select List Award. With National endowment of the Arts funding, Bob Brozman began production of a feature-length documentary film about the Moe family and their amazing 54-year-long world tour. Over the years, Bob Brozman’s passion for National Guitars led him to build a large collection of these attractive art-deco era instruments. After receiving a letter from the then-88-year-old inventor John Dopyera, Bob Brozman visited and became good friends with John and his family. This led to further research, and in 1993 Bob Brozman’s massive work The History And Artistry Of National Resonator Instruments was published internationally. He has also written for several music magazines concerning historical and instructional subjects. In 2001 Bob Brozman released Nankuru Naisa (Riverboat Records ) with Okinawan vocalist and sanshin maestro Takashi Hirayasu as well as an array of guest musicians Los Lobos’s David Hidalgo. Mahima, a collaboration with Indian slide guitarist Debashish Bhattacharya came out in 2003. On Mahima, the two guitarists explored the blues, Hawaiian and Indian music. The album also featured vocalist Sutapa Bhattacharya and tabla master Subhashis Bhattacharya. Bob Brozman’s 2005 release Songs of the Volcano (CD/DVD) documented his two journeys to Papua New Guinea in 2003 and 2004, when he recorded with 60 musicians from five string bands. In 2007 the musician released Lumière, an album featuring the Bob Brozman Orchestra – a unique concept where Bob Brozman intricately played each instrumental part, building layer upon layer to formulate the tremendous sound of an extensive orchestra. He revisited the influences drawn from previous collaborations with artists such as Debashish Bhattacharya, René Lacaille, Djeli Moussa Diawara and Takashi Hirayasu to reflect on the profound effect travel had on his life. Bob Brozman teamed up with John McSherry and Dónal O’Connor on Six Days In Down (2010). In this project, Bob Brozman fused his characteristic guitar sound with Irish music, featuring the uilleann pipes played by virtuoso John McSherry and the fiddle, played by maestro Dónal O’Connor. The album also featured vocalist Stephanie Makem. His deep knowledge of musical history and arranging enabled him to create large band arrangements and direct music for film, radio, television, and stage. His rhythmic style featured elements of blues, jazz, Gypsy swing, calypso, and even the most modern beats. His chords and harmonies were a blend of timbres from Hawaiian, Indian, African, Japanese/Okinawan, Caribbean, and American roots. Bob Brozman did not own a CD player, and at one point he said he only ever listened to old music because he believed a “mental pollution” attached itself to the mass-media culture which sullied anything produced after the 1930s. He particularly hated rock (“the most boring beat ever devised by man”), believing its rigidity stifled imagination, although his antipathy towards modern music was softened slightly by the onset of hip hop, whose rhythms he adapted to great effect on some of his later recordings. “The guitar is the ultimate colonial instrument,” he said. 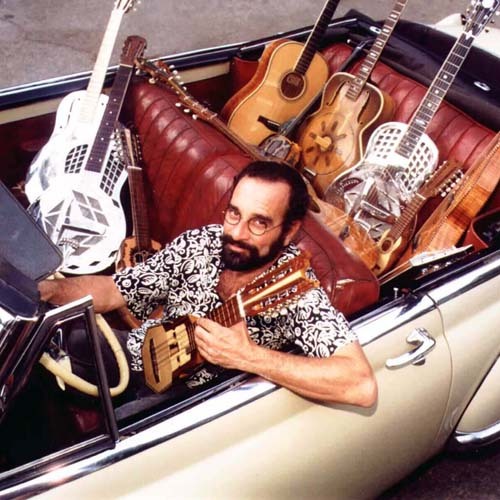 Through the years Bob Brozman gathered a large collection of National steel guitars, gave lectures, ran workshops, directed film music scores, and wrote The History and Artistry of National Resonator Instruments. Despite suffering regular pain as a result of a car accident in 1980, he never stopped touring. His most recent record was last year’s Fire in the Mind, a blues album with a diversity of new and old stringed instruments, including instruments not normally used for blues. Bob Brozman is survived by his wife and partner of 15 years, Haley Sage Robertson Brozman, daughter Zoe Brozman, 20, and brothers in New York City along with a large international community of friends and fans. It is their desire to carry out Bob Brozman’s vision in the creation of a foundation to help third-world musicians obtain the musical basics that western musicians take for granted.